The dust has settled from United Airlines’ new award booking rules which went into effect on October 6. While the news was worse than originally thought, there are some tricks that allow for creative award routings. In United’s zeal to create a mechanical computer-dependent system, it seems they did not program in enough rules to prevent travelers from hopping around the globe with complex itineraries that provide tons of value for MileagePlus members. In one bit of good news, United phone agents seem just as angry about these changes as the callers, and are complaining to management in an attempt to get United to either make the booking rules less strict or allow them to manually override award prices during phone bookings. The Excursionist Perk cannot be in the MileagePlus defined region where travel originates. For example, if your journey begins in North America, you will only receive the Excursionist Perk if travel is within a region outside of North America. Travel must end in the same MileagePlus region where travel originates. The origin and destination of the Excursionist Perk must be within a single MileagePlus defined region. The cabin of service and award type of the free one-way award must be the same or lower than the segment preceding it. At first glance, these new rules may seem quite restrictive comparatively. However, it is possible to piece together some very interesting itineraries which may not exactly fit the spirit of what United intended, but would definitely stretch your miles. You might need to experiment a bit to figure out what’s possible. Be sure to think outside the box. For example, we put together a bizarre itinerary across the globe, and guess what? It priced out as one award ticket. We were able to find business class saver availability for each leg of the following itinerary with back-to-back segments and when we went to select the individual flights, the second segment prices out at zero miles. The total price for the above itinerary comes out to 160K miles, exactly what it should be for a round-trip business class saver award from the U.S. to South Asia per United’s chart. We selected flights so that each segment departs well over a day after the previous flight. So it appears that you can actually work in two stopovers into an itinerary instead of just the one that was allowed under the previous rules. The only way to do this is to make the stopovers at the departure and destination cities of your Excursionist Perk segment. 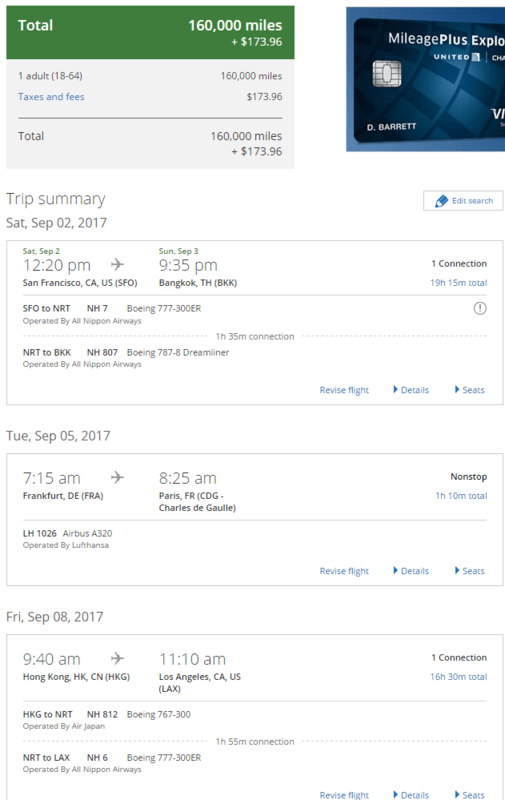 United actually makes a distinction on its website – the Excursionist Perk is not defined in terms of time like the old stopover rules were. So while they don’t explicitly say that you are now allowed to have two stopovers, the rules governing the Excursionist Perk make it pretty clear that you can, and United’s website is definitely pricing out awards this way. The screenshot below proves that the itinerary we have detailed here is bookable online at the right rate. This award prices out at 150K miles which is the correct price for a business class saver partner award on a round-trip ticket from the U.S. to Japan. The nice thing about this itinerary is that it allows you to visit two cities in China which is in the North Asia region, while paying the Japan region price. In fact, all three of the non-Japan Asian regions (North, Central, South) cost 160K miles roundtrip in business for partner awards, while the Japan region costs 150K. One more situation you might find is where you cannot get preferred routing to show up online, but you know that award flights are available by using the multi-city tool. A workaround that has been effective in certain instances, but is not guaranteed, is to make a reservation online and then call in to have it modified. An example is if you book an international award from a gateway city, but cannot find the same itinerary with a domestic connection to get to the gateway city. If you use the multi-city tool to add the connection, it would cost 10K-12.5K miles each way. But if the connection is a United operated flight, it is possible to get phone agents to modify the reservation with the connection added for no additional miles.